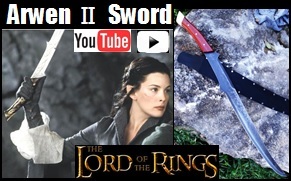 Sword of Arwen II - Influenced by the movie Lord of the Rings. Arwen's sword is called Hadhafang which means Throng-cleaver. It once belonged to the Elven princess Idril, who wed a mortal man and bore Earendil, the father of Elrond who in turn was father to Arwen. Before Arwen's birth Elrond wielded Hadhafang at the end of the second age of Middle-earth, during the Last Alliance of Elves and Men in the great battle against Sauron. Later his daughter Arwen used Hadhafang when she aided Frodo in his escape from the Ringwraiths. Engraved on the blade are runes in the Elven language of Sindarin that say "Gud Daedheloth." This translates to "Foe of Morgoth's realm. ", and is the same etching we have on the Strider Knife.